A new thing we are doing with our blog is featuring the history of the towns we provide our hardwood flooring services to. Today we’ll be talking about the history and background of Bernardsville, NJ! Bernardsville is a borough in Somerset County, New Jersey, which is located in the northeastern corner of the state. Its residences hold affluence within the state itself, but was also ranked 76th in the country among the one hundred highest income places with at least 1,000 households. The population of Bernardsville, at last count in 2010, was 7707 people, and is currently estimated at 7755. 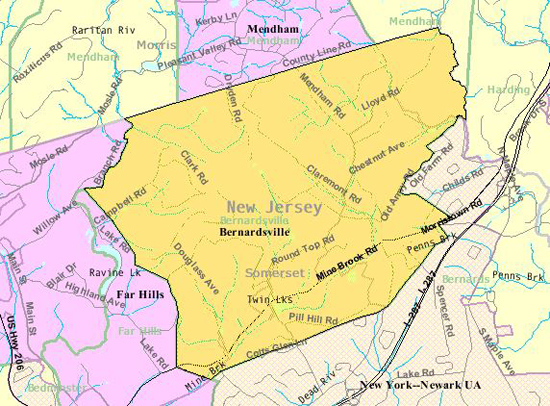 The history of Bernardsville New Jersey is as rich as its occupants, and was officially incorporated as a borough in March 6, 1924 through an Act of the New Jersey Legislature. Prior to its incorporation the borough was part of Bernards Township and was formally referred to as Vealtown. Later it became Bernardsville as a hat tip to the Colonial governor of New Jersey, who served from 1758 to 1760, Sir Francis Bernard — who later became the governor of Massachusetts. Providing exceptional camping and resourceful access to Great Eastern Forest and Basking Ridge, Bernardsville — while it was still Vealtown — provided strategic positioning during the Revolutionary War. General Charles Lee rested his troops on the night of December 12, 1776 in the borough, blindly assuming the coverage would provide a much needed break from the pursuit of the British. Unfortunately for him, his rest area’s proximity to the Continental Army’s general’s manor house participated in his capture the following morning, allowing him to be removed to New York while disbanding his military sector. It was not until after the Civil War that many distinguished and preeminent New Yorkers began taking to the beautifully mountainous area as vacationers during the summer, before making the scenic town their homes full time. In 1872 the Gladstone Branch railroad was built and ran directly through Bernardsville, expanding its growth and development for years to come, directly contributing to its independence in 1924. With exceptional trade and transportation aspects added to the small town’s resume, affluent New Yorkers took refuge from the ever-growing city to the country-like atmosphere and company of like-minded residents. Growth, as it were, was slow moving, and still is, allowing Bernardsville to hold its prosperous position in New Jersey’s history and current standing. In 1930 there were 3336 residents in Bernardsville, with the total estimate growing to 7755 in 2012. The largest population boom was between 1950 and 1970, growing from 3956 to 5515 and 6652 in each of the three decades, respectively. Since, the population has hovered under 8000 people, where it is expected to remain as the cultural combination of small stature and elite standing going forward. The famous Olcott Avenue was indoctrinated as Olcott Avenue Historic District in February 2009. With the Olcott Avenue School serving as a the historical structure that holds the community’s reverence of past days, the entire avenue serves as a reminder of middle class growth in the region, and its location serving the perfect opportunity to represent the National Register of Historic Places. Measuring just under thirteen square miles, Bernardsville has played host to many famous residents in its history including the American Philanthropist and Socialite Brook Astor, the founder of Prudential Insurance, John Fairfield Dryden and the former first lady Jacqueline Kennedy Onassis. Do you live in Bernardsville, NJ and need a quote on a hardwood flooring project? Contact us today.